One common request is the ability to add comments or notes to messages. Although Outlook doesn't let you "stick" it's Notes on a message you can use the Follow up flag to add a short note (up to 255 characters) in the Flag to field (set the Start and Due dates to None). The note will display when you view the message. Fortunately, there is a better option: an addin that pins sticky notes to email messages. The Tools list below has a several add-ins to choose from. Outlook 2013 users with Exchange 2013 mailboxes can use an Outlook App called TakeNote. This free app adds a field to the message form. Get it from the App store. Use GumNotes to add notes to files and documents, including Outlook Emails, Contacts, Meetings, and Appointments. The most common request for Outlook is the ability to add notes to e-mails. 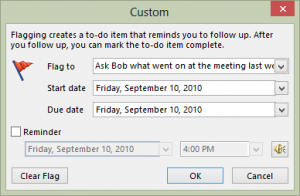 Outlook Notes for Email provides the ability to add a native Outlook note to e-mails. For better visibility it also adds an optional yellow category to the message. All Outlook attachment features are available like preview and searching whereby it doesn't require separate screenspace to display its content. Outlook Notes for Email comes with a 14 day trial period and is available for 32 and 64 bit Outlook versions.